Being a boy mom has its frustrations. You find pee everywhere except in the toilet. In the past, William has walked out of the bathroom saying, “I sorry mommy.” “Why Wheels?” “I peed on your wall.” Once I walked into the bathroom to find the toilet paper roll that was on the holder was soaking wet. I thought maybe they had taken it off to play with and it fell in the toilet and they put it back thinking I wouldn’t notice. Nope. Better than that. One of them peed on it. Blocks, hot wheels, and little shark figurines (with pointy fins) are just a few of the obstacles I must avoid. Stepping on any one of these with bare feet will send any mommy hopping around in pain trying not to say a dirty word. Because I know the extent of the pain, when I’m walking in the living room or playroom, I walk looking down. I’m constantly being shot with Nerf guns. Mommy is there favorite word. They can repeat it 20+ times in a row with no hesitation. Also, I can find dirt pretty much anywhere. Dirt’s favorite places in my house are typically fingernails, shoes, my freshly painted white kitchen cabinets, windows, and sofa cushions. I’m outnumbered three to one. Four to one, if you count Tookie. Despite the craziness that comes with being a boy mom, I wouldn’t change it for the world. Picking out clothes is easy. Dressing boys is typically an easy task. Jeans and t-shirts are the staples at our house. Sure, we want them to look nice, but even that is easy. Polo shirts and pants are our go to most school days. Although it’s easy, it’s not always cheaper to dress boys. They wear clothes out quickly! Also, Wesley is now under the impression he can only run fast if he is wearing Nike shoes. We still buy him other brands, but he voices his concern of not being able to run fast enough in them. They love to snuggle. If either one of my boys are on the sofa watching a movie or T.V. they prefer that dad, or I are next to them. They love being near us. Wheels especially loves to snuggle. They are adventurous. My boys are still young, so sometimes the uncertainty of not knowing shows. Regardless, they are bold and adventurous. Jumping off the trampoline for the first time was no obstacle for William. As I cringed at the thought of him breaking his little leg, he made a perfect landing and smiled, proud of himself. Their energy supply seems endless. Some days, they make me tired watching them. They can run, dance, ride bikes, and play all day. Still they want to do more. These kids are like little robots. It makes me smile to see them enjoying life so much with no real worries. Boy toys are cool. Playing with boy toys is fun. Wesley’s 5th birthday party was this past Saturday. After opening presents, we were shooting water guns and slime guns, playing T-Ball, and playing with airplanes. Everyone was having a good time or at least laughing, including the adults. Boys have a protective instinct. When the boys see someone hurt, they instantly want to check on them. If I’m having a bad day, they want to cover me in their blankeys and give me their stuffed animals. It is comforting to see such rough and tumble boys who constantly talk about poots and poopy care about others. I’ll always have muscle. Especially when the boys get older, I will always have help around. Whether it is to move furniture around or take out the garbage, I’ll have the man power to get it done! I get to be their biggest cheerleader. As they get older and start playing sports and having hobbies, I get to be their first and greatest cheerleader. It’s already began! They have played micro-soccer for two years now. I’m probably the loudest mom on the field, and I don’t care! I am proud of my boys! They will be best friends. This, I personally believe, especially applies to my boys. They are only 15 months apart. Every other year they will be on the same sports teams. They will only be one grade apart. They will most likely have several of the same friends. They are going to have a special bond that no one can break. It comforts me to know my boys will always have each other to count on. Working with their daddy makes them happy. One of my favorite things is watching the boys work outside or around the house with my husband. You can see the excited sense of accomplishment on their faces as they help in whatever way they are told. Whether it’s folding and putting away laundry, cleaning up the back patio, helping put something together, or working in the yard, these boys love feeling like they are making a difference with their daddy. This also applies to Pop, their granddad. He will let them help work on cars, rake, pick up sticks, or ride the back hoe. They are hard little workers. I truly enjoy and cherish when they spend “guy” time with the important men in their lives. They love their mommy more than anything. This is my favorite. Boys love their mommy. The bond between a mom and her son is difficult for anyone that isn’t them to understand. I’ve noticed that majority of the time my boys don’t necessarily care that they are in trouble. What bothers them is feeling like they have let me down. I believe the reason boys act out around their mommy’s more than anyone else is because we are the person they feel the safest with. They feel comfortable with us. They can let out their true feelings and emotions without having any fears or reserves. Boys love their mommies, and I love having that in my life x2! As I’m writing this William has asked 20 times to sit in my lap. So, he’s now sitting in my lap watching me type asking me about the scotch tape that’s sitting beside the computer. Being a boy mom is special. I wouldn’t trade it for the world. FYI, I chose the number 11 because it’s my favorite number. I could probably name a million little things I love about being a boy mom. haha…I just have to laugh when I read this….I raised 3 sons and none of them could aim very well!! I almost feel like it’s a right of passage for a boy mom! Hahaha, you got that right! Thank you so much Crysta! I appreciate you sharing this with your friends. Love all of this! That first picture is hilarious! This is super cute. I have one son and you hit all the great things I love about him. This is really sweet. I had brothers growing up and always thought it was awesome growing up with boys around. Great article! I agree with all of these. As I am typing this, my son is snuggled up to me with his head on my right arm. 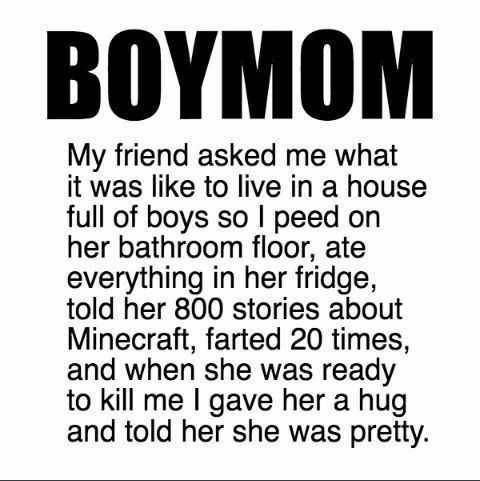 Being a boy mom is the best. Girls are great too, but there is just something about boys. They sure love their mommas! I so understand this, just had my second son 17 days ago so he is still like a newborn and now I am outnumbered and my first boy has endless energy from I don’t know where and I was just imagining yesterday how it’s going to be when they both decide to play together and scream all day. Congrats on the new baby boy!!! Enjoy him! They are going to be best and also aggravate each other more than anyone else! Fun times ahead. LOVE this blog post! I am a boy mom to 1 son and I wouldn’t trade it for the world! I was smiling while reading the post! You have explained your experiences in such a fun way! Hahaha, thank you Irina. I know girls are amazing in some of the same ways as well as totally different ways! Boys are just special to their mamas! This post made me laugh! I don’t have kids yet but I have always wanted to be a mom of boys! This helps give me perspective of what I’m in for! Boys are definitely an adventure! And they looove their mommy. Oh my goodness! I laughed, cringed (That’s a lot of pee) and got teary eyed reading this! My friend just found out she is having a boy, I am sending this to her! Thanks Lauren! I hope your friend enjoys it as well. Boys are a big mess, lots of adventure, and even more love! Love this. Reminds me of my nephews. OMG, that was tooooo funny. I have 2 boys and a girl and I feel like all my kids are messy but have to say because I’ a stay home-mom, my kids try at times to clean up especially my youngest son. With my 2 boys I feel like I have 2 little bodyguards always protecting me and my daughter!! This was fun to read. I am a first-time mommy to a little boy – the wildest thing I have ever seen! I clean up after him more than 20 times a day & he’s head to toe filthy all the time… sometimes I feel like the worse mom ever because he’s always dirty, the house is always dirty, and he ALWAYS loves on me… which makes me dirty too… but I wouldn’t change it for the world. He’s so worth it! I love this! Girl, you are doing great! Thanks for sharing some insight into your life. It’s nice to hear that other’s share your frustrations and joys! Jaja, I love this! I have a 14 month old! He is so adorable! The fun that awaits me when we start potty training lol Thanks for sharing ❤ I love cuddling with him, and yes his outfits are definitely easy! I get so excited about boy birthday themes! They seem so fun! Haha. You stole the words from me. Got it so right! A friend had told me “ make it fun put a Cheerios in the toilet and tell your boy to aim for it. It will help” little that she knew my son wanted to eat the Cheerios lol!!! Seriously it’s well written and I think you have it spot on! I’m a mom of 2 boys! Hi Melanie! I’m so glad you stopped by. I’ve heard the Cheerios thing too! I could see my youngest wanting to eat them too, haha. I tried stickers in the bottom of the toilet. They only worked for the first few seconds of them using the bathroom, then they were slinging pee all over the place again. Thanks for your kind words! I hope to see you back here in the future. Your post is so awesome. It made laugh especially the start. I saw my mom doing or saying all the points you mentioned above. This is so cute! I am not a parent yet, but if I had my choice, I would be a boy mom for sure! I’d rather play with hot wheels & minecraft than have to play with makeup & attempt to put a hair tie in. 🙂 Love this post. Sorry, I laughed out loud at the toilet roll pee thing! I’m a girl mom and I think we are done with babies but oh how I wanted a boy ❤ loved this read. Haha I felt the same way with having a girl! My husband says he only produces boys 😂. So, we’ve come to the conclusion we probably won’t try again! Aw! Oh yes! BOYS are super cool! If I ever have kids, I sure would love a boy ’cause they are super fun. YES!! Hahaha! I am a BoyMom too. I have two boys, ages 4 and 2. The pee is everywhere!! The struggle is real! My two year old recently decided to pee in our bathroom trashcan! The worst pain in the world is stepping on legos! I agree, though, there are many things to love about being a BoyMom. They sure do love their mommies. 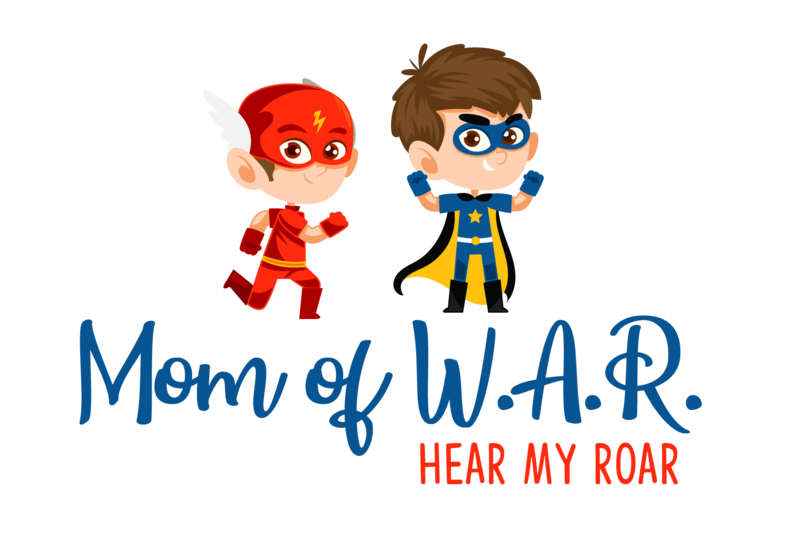 My blog is all about being a mom and finding the inspiration in the every day chaos. Loved this post!